Kashiwajima is a small island around 4 km in the westernmost tip Otsuki Town of Kochi Prefecture in Shikoku, but the peripheral sea area attracts its attention nationwide as a spot of scuba diving and fishing in the rich sea where fish rise to approximately 1,000 kinds the same as the Kuroshio Current of the Pacific and the entrance of the Seto Inland Sea. 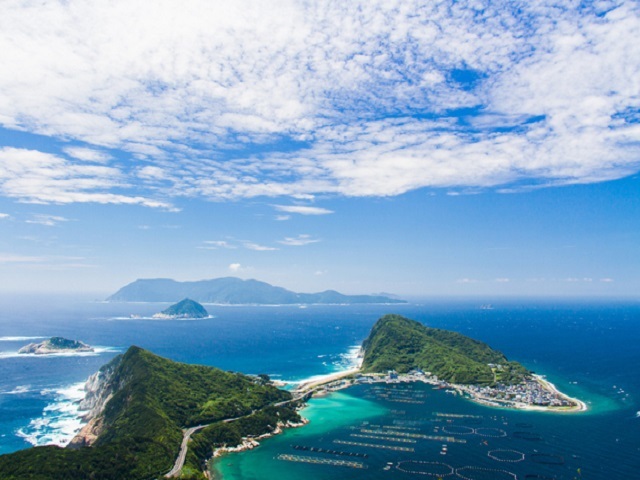 The beauty of the sea around the island is splendid so as to be equal to Okinawa and the Ogasawara Islands, which divers admire for sure. Snorkel is enough for a tourist who does not try scuba diving. The experience of the sea of azure on a sightseeing boat is impressive. It is really far for non-residents, staying overnight at least is necessary. However, the charm will make you go again if you experience it once on this island. Sukumo City is the start spot of public transport to Otsuki Town. Sukumo is the terminal of the Tosa Kuroshi Line, so using a bus from Uwajima is convenient. A bus runs from Sukumo to Kashiwajima. Public transport is really inconvenient anyway, so using a car to get is recommended. 1 hour 50 minutes from Kubokawa Station to Sukumo Station via Nakamura Station with 1 train per hour. 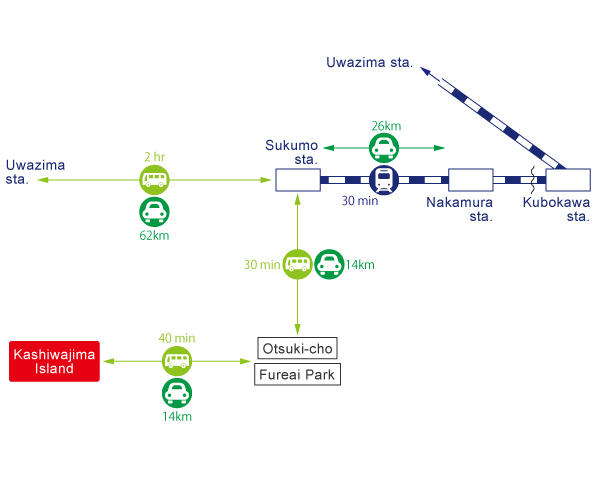 A 2-hour bus ride from Uwajima Station to Sukumo Station with 11 buses perday― a 30 minute bus ride to Fureai Park in Otsuki Town with 10 buses per day― a 40-minute bus ride with 5 buses per day―Kashiwa-jima. 1 hour from Uwajima Station. 1 hour 10 minutes from Nakamura Station in Shimanto City.